Geneva (AFP) - World football boss Sepp Blatter and UEFA president Michel Platini on Wednesday strongly condemned the violent scenes that forced a Serbia-Albania football international to be abandoned. 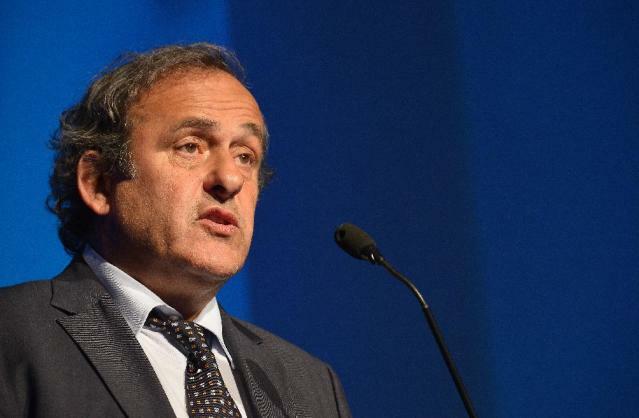 Platini called the politically-charged violence in Belgrade "inexcusable" while Blatter said football "should never be used for political messages". Players from the two sides clashed on Tuesday after a drone carrying a pro-Albanian flag was flown over the Belgrade stadium where the Balkan rivals were playing a qualifier for the 2016 European Championships. "Football is supposed to bring people together and our game should not be mixed with politics of any kind. The scenes in Belgrade last night were inexcusable," the spokesman quoted Platini as saying. Blatter added: "Football should never be used for political messages. I strongly condemn what happened in Belgrade last night." Later on Wednesday, UEFA announced that it had opened a formal investigation into the events, after having studied reports from the match referee and coordinator. The Football Association of Serbia is under investigation specifically over the setting off and throwing of missiles, crowd disturbance, a field invasion by fans and the use of a laser pointer from the stands. UEFA said that the Football Association of Albania was meanwhile being probed under charges of refusing to play and the display of an illicit banner.